Are you looking to invest in a cryptocurrency that has the potential to reap high levels of profits? Do you want to know more about the technology that could convert centralized systems across thousands of services into open source, decentralized networks? This technology is Ethereum, and it is one of the most talked about crypto-technologies of the moment, alongside its currency, known as Ether. This book is going to provide you with everything you need to know about Ethereum and whether it is worth investing in now. Like many people, I became interested in Bitcoin years ago, when Bitcoin was still relatively new, but hinting at a huge profit margin for those who took the risk and invested. It was after a couple of years playing around on the Bitcoin market that I heard about a new type of blockchain technology, one that wasn’t just a digital form of payment, but one that could support potentially endless different types of applications. Not only that, but it comes with its own currency. This, to me, sounded like a potentially profitable situation, so I decided to dig a little deeper. Unlike Bitcoin, Ethereum is still largely unknown to those who don’t keep up with the cryptocurrency world, so the amount of information available is limited or highly technical. Still, it was fascinating and the more I read about Ethereum, the more I began to see its huge potential. And I’m not alone. More and more Fortune 500 companies are investing in Ethereum technology as it becomes increasingly lucrative and poises to change business processes as we know them. I decided to condense my research and share my knowledge on Ethereum by writing this book. The book is designed for those who are new to cryptocurrency, but want to invest in it or learn more about it, as well as for more experienced traders looking to expand their portfolios. With a 5,000% increase in value in the first few months of 2017, Ethereum is proving to be a profitable currency. Still, as it is so new – it was only launched in 2015 – it comes with many infancy-related risks. It’s partly this that makes it so exciting. 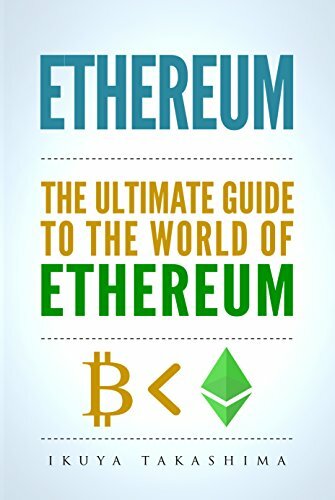 This book will help you make your own investment decisions and decide if Ethereum is the right coin for you after weighing up the pros and cons that are presented here. So far, Ethereum has made me good money and I was lucky to make the investment when I did. However, now is not too late to invest, not by a long shot. In fact, now is the perfect moment to make the most of Ethereum’s infancy and gain potential first-mover advantages. Ethereum’s technology is only at the beginning of its potential growth stages, possibly reaching to dozens of industries and thousands of services. If its technology is adopted the way it is expected to be, Ethereum will enjoy a long and lucrative spot at the top. The profits are ripe for the taking. Should I Invest In Ether?